Rufus Thomas was born on 26 March, 1917, in Cayce, Mississippi. He moved to Memphis when he was about three years old. By the time he was a young teenager, he was already acting as master of ceremonies for talent shows on Beale Street. His academic studies seem not to have been neglected, however, for he started studying at the Tennessee A&I University, but shortage of funds forced him to leave in order to pursue a career as a full-time entertainer and presenter of new talent (he discovered B.B. King, Bobby Bland, and Johnny Ace). He began writing and performing his own songs in the 1940s and in 1950 made his first recording. By 1953 he was recording for Sam Philips's Sun Studio. Rufus Thomas's release prior to "Tiger Man" was also animalistic — "Bear Cat," an answer-song to "Hound Dog." Joe Hill Louis (or was it Lewis? 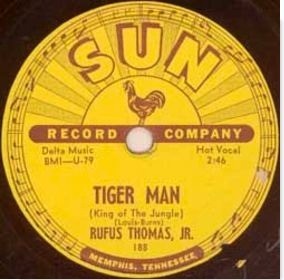 ), one of the writers of "Tiger Man," played on the original recording, though it was credited to Rufus Thomas. The other name in the writing credit, Burns? Well, that was Sam Phillips getting in on the deal, but using his wife's maiden name (she was Rebecca Burns) instead of his own family name. "Tiger Man" had earlier been recorded for Sun by Joe Hill Louis himself on 17 November 1952, but his recording was not released until it appeared on a compilation in 1986. A recording of Elvis rehearsing the number, made on 25 June 1968 has also been released on the set, "Platinum, A Life In Music." Rufus Thomas died on 15 December, 2001.